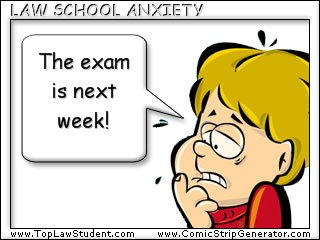 This past week was final exam time in my district for the high schools. It's a pretty standard affair. Students are given 1.5 hours to complete an exam that is supposed to evaluate all of their learning for 20 weeks. The exam is worth 20% of their overall semester grade with the two 10-week marking periods being worth 40% each. Before this year, I've never really had an issue with the setup, but it really bothers me this year. I'm not sure why, but I feel like this is the dumbest idea conceived for evaluating student knowledge. How can one test be worth so much? There has to be a better way. Surprise, I have a better way (in my opinion). The emphasis for a class should be placed on learning the material in the class during the two marking periods, not cramming for an exam in the hopes of bringing up a grade. I would like to see a different plan that looks like this. Instead of 1 exam that students need to cram for, I would like to see the average grade earned on unit assessments be taken and used as 10% of the overall semester grade. The two marking periods would be assessed as 45% each and the average grade on the unit assessments would be used for the remaining 10%. I feel this places more emphasis on the learning during the marking periods and less emphasis on cramming for one exam. - This new method would relieve these kids of the burden of studying for 7 exams take over 5 days. - Teachers would not be hammered with 120 essays to check in the course of one week to get the grades entered in on time. - Instead of spending a week of half days testing, the time could be spent on learning. - It's a better assessment of what a student knows. All it takes is for one bad day or one misread essay question to potentially kill a student's grade by 20%. A final exam should not be punitive. It seems to be me that students are getting more and more stressed each and every year and I feel that schools have a responsibility to keep the kids as sane as we can while providing top notch learning and assessment? I wonder, do we even need final exams at all? Is that discussion even happening in school districts? After a very close vote, M. Phillips (@bcteacher) has one the ADSC contest for her submission. Congrats to Mary and thanks for voting everyone! I was able to narrow the entries down to a top 5 using a random number generator. Feel free to vote as much as you want for your favorite lesson idea. The person with the most votes will receive a copy of Adobe Digital School Collection for their school. Let's look at the contestants. 1. Midnight Traveller - Using Adobe to create Superheroes to help teach math! Here is a link with even more details. 2. M. Phillips - Check out how she will use the ADSC to challenge popular myths about what a family looks like. Follow this link for more information. 3. Steve Issacs - This contest is exciting. Creating original graphics (sprites) in my video game design and development course is an integral part of the process. Teams work together to create video games and I allow students to take different roles (i.e. sound engineer, graphic designer, programmer). Photoshop would greatly enhance the experience for the graphic designers and help my students to create high quality sprites for their games. 4. Jeremy M - My class is creating and authoring a lot of original content. The ADSC would provide students another opportunity to learn a different tool in which they could continue to create and share. 5. Alice Hartel - I would have my students research animals and then become the animal by inserting their image onto the animals body. Next they would write about their life as the animal in first "animal" person. I would take their pages and bind them into a Classroom Zoo Book. This is an activity that could be expanded to include scientists, inventors, or explorers. Last night was just another night of the school year for me. I worked all day and did some prep for Final Exams next week. Students were supporting their basketball teams at home and having a good time. Before I went to bed last night, I check my Twitter feed of the school account to see if anyone had tweeted me. My feed was filled with the hash tag #IversInOurPrayers. I was very worried because I had taught an Ivers in class a few years ago. I clicked the tag and read hundreds of tweets showing love and support for the Ivers family. I finally found the source of the tweets and was devastated. Two students at my high school lost their father. It is a tragedy for anyone to lose a parent. It has to be one of the most difficult things to deal with. What made me feel good was seeing the tweets from all of the different students showing their support for this family. Some even said they didn’t know the family personally, but they were in their prayers. So many students were tweeting the tag that #IversInOurPrayers trended in the Detroit area for a short time. The students also managed to get kids to wear blue in support of the family today as well. Tweets and retweets filled the night as kids worked hard to show their support for this family. It was amazing. I bring this up to show the power of Twitter to people out there that are skeptical of its use or impact on students. There are school board members, teachers, administrators and others involved in the educational field around the country that feel that social media has no place in education and it should be kept out of schools. This show of love, support and compassion for fellow students is proof that Twitter can be used to great things in the educational environment. Every tool has its downside, but the upside should be looked at and embraced when it can help bring learning to a different level. For those of you out there still unsure of the value of Twitter, take a minute and scroll though the #IversInOurPrayers feed and then tell me it’s a passing fad. Now, if you will excuse me, I need to put on my blue sweatshirt and get to class. Float Mobile Learning sent me a copy of RabbleBrowser to see all of the cool things it can do and I can say that I'm very impressed with what it does. Using RabbleBrowser, one person can lead or facilitate a shared browsing experience with an unlimited number of locally connected peers. As the leader browses the web, the others in the session with them will see the path they are taking. Integrated group chat, private chat and bookmark sharing keeps the collaboration levels high. Using the easy integrated social tools, anyone in the session can share URLs to the web via email, Twitter and Facebook. We’re confident that this will become a very useful technology in any class, team leader or mobile learning presenter’s toolkit. The initial release is feature rich, but we have a lot planned for this app in the future. •Shared browsing between a leader and a virtually unlimited number of connected clients via WiFi on a common network or via Bluetooth. As a teacher that is working on creating a more collaborative environment, this seems to be the perfect app to do just that. With my class set of iPads right now, I either need to put a link on the board, email everyone in advance or place something in Dropbox. With RabbleBrowser, I can connect all of my students to the school wifi and lead them through the content in a very simple fashion. There have been times when kids just cannot get the web address correct and the class needs to wait while they catch up. RabbleBrowser will help eliminate those little stoppages so more time can be spent on the task at hand. I also love the fact that students can bookmark and share them easily through email, Twitter (If it were not blocked) and Facebook (Again, if it were not blocked). The multiuser chat feature is nice for creating a strong backchannel in the classroom while groups work and present. As a teacher, I love the possibilities that RabbleBrowser brings to the table. It will be very nice to know that my students are following along and leaving comments on the right side to enhance the discussion we are having in class. Since my students use blogs to post their work, this would be a great way to look at the work a student has done and discuss it as a class. News articles or other web based reading could be easily shared and discussed in class with room for a backchannel to take place. I always come back to the sharing features which has me excited. Too often, kids find cool things and they do not have the thought to share them. RabbleBrowser allows for quick and easy sharing from the app. Facebook and Twitter might be blocked, but email still works great. Once the blocks have been lifted in my school, I could see our class tweeting links to the community about the things we are reading and discussing. Using the Apple TV will also all all of the students to see what is going on as well, so that will be a nice bonus. RabbleBrowser costs $1.99 and I think it is worth every cent. A class set of iPads could be covered for about $60.00. This will be the best $60.00 you could spend on an app that will have your students collaborating using their iPads. I recommend RabbleBrowser to all schools that are using iPads in the classroom. Note: I was given a copy of RabbleBrowser for the purpose of this review. Things have been pretty crazy for me the past few weeks. So much so, I've "felt like a plastic bag drifting in the wind." ;-) Here are some of the things I have going on and really want to share with all of you. A little while ago, I saw a post by Kelly Tenkely about a site that will help turn your site into an app. When Kelly suggests anything, I always take a few minutes to check it out. While playing around on Mobile by Conduit, I really liked what I saw. I started to play around with it and the next thing you know, I had an app. Well, I have an app on the Android Marketplace and one will be in the Apple app store in the next couple of weeks. It's called The Nery Teacher. Check it out! While messing around, I was looking at the pricing structures of each and was amazed that you could choose many different types of pricing. The Android setup was far more complicated than the Apple setup (Not Surprised). I had to choose different prices for different countries if I was going to charge. I really liked checking things out, so I set the price for $0.99 and started to fool around with the other pricing structures. The next thing you know, I hit upload and my app is set for $0.99. That simple. I do not expect to roll in the dough for making an app, but it made me think about the content I offer on the site and if people are going to pay, I should offer some more Nerdy Teacher stuff. This lead me to the next adventure. This is an idea that I have been tossing around for many months. Tim and I were going to do a very awesome #EduBro podcast and it would have been epic, but the time involved was just too much for us. Having said that, it is still not out of the realm of possibility. The thing that has kept me busiest has been consulting work. When I wrote my first post over two years ago, I never thought I would be doing any of this. I was shocked when people asked my opinion on things, so you can imagine when companies started to ask for my two cents and offer to pay me for it. I wasn't sure what I was doing or if I was being helpful, but I started to get my business legs underneath me and it became an exciting adventure. I get to help people who are looking to help other teachers and students. There have been times when I have used a product and wondered if a teacher was ever asked their thoughts before it was rolled out. Now, I'm that teacher in some cases. I've had a chance to work with some great companies and you have seen their ads here and there on my site. I tell myself that I will only work for companies that I have had a chance to explore and feel good about. Product reviews are always honest and I spend time on them to make sure they are checked out. I'm always looking for ways to help out companies that are looking to help out teachers and students. I'm not naive to think that they are not in it for the money, but if I can help make a product better for teachers and students with my knowledge of what teachers and students want, then I feel like I'm doing a good thing. There are tons of crappy products out there, but if I can help steer educators toward the good ones, then I feel awesome. That's pretty much everything that I have been doing the past few months. I've still have many of my siller posts rolling around in my brain (Everything Learned about Education I Learned from Watching Phineas and Ferb, etc) that you will see in the next couple of months. I'm excited about the different adventures in my future and I can't wait to share them with all of you. If you have questions, suggestions or ideas, please feel free to drop me a message in the comment box, send me a tweet to @TheNerdyTeacher or send me an email. Part of the iPad pilot had the devices staying in the classroom. I quickly saw the limitations, but that is a topic for another post. I need to focus my energies on creating lessons allow the kids to function in a shared tablet environment. We have just started Adventures of Huckleberry Finn and the students have a hard copy at home to read and there is a digital version on iBooks. On iBooks, students can highlight and annotate passages they feel are important. I think this is a valuable skill for students to master, but it is difficult to teach without making many paper copies. So, I devised a plan yesterday. Each student is assigned a specific tablet and they sit in tables of five. The tables were assigned a chapter to annotate. The students had already read the chapter the night before, so it was a quick re-read looking for four specific themes discussed in class. At a table of five, four students would work on one theme each and the fifth student acts as a secretary to record all of the annotations on his iBook. At the end of the allotted time (15 mins), the secretary connects to the projector, via Apple TV, and present their group work to the class while others follow along and add those notes to their iBook. Since each iPad will be at a different table, each student will be working on different chapters so the iBook will be mostly filled out by the three student users. I love the idea of students being able to look at the thoughts of other students and see why passages are important to them. This really brings collaboration to an entire new level. The kids said the really liked highlighting the book and leaving notes. This could be a completely different way to teach a novel in my class. I'll keep you posted on any new developments! After some long and hard consideration, here are some tools from my class that have been forced to retire since the move to a more paperless environment and with adoption of new technology. Stapler: The stapler used to be one of the most important parts of my life as a teacher. Students would line up and attach their work to the rubric and drop them on my desk. Every assignment would have the shiny piece of metal in the upper left hand corner. Sadly, for the stapler, there is nothing to staple in my class anymore. In class writing still happens, but I encourage students to use the paper clips. The paper clip only has a few months left before retirement, so I’m trying to get the most out of them. At any given time, I would have 3 or 4 staplers floating around the room so students could assemble their work. The stapler has been good to me, but it’s time to part ways. Hole puncher: The stapler was all about giving, but the hole puncher was about taking. For the assignments I would forget to hole punch at the copier, the hole puncher could be counted on to help the most organized of my students. Tirelessly popping out three little circles of paper was its only job and it did it well. I would like to say he will be missed, but that would be a lie. I like the extra desk space. The Document Camera : This guy has gone the way of the overhead machine. With the iPad2 and the Apple TV, there is nothing the Document Camera brings to the table. He sits at my desk with his head hanging down in disgrace. His stationary existence just doesn’t fit in with this mobile world. He was the most popular kid in my class for a couple of years, but now he is just another obsolete tool. I’m sure I can find a home for DC. Hopefully. File Folders of Student Work: The days of holding onto a student’s work in a folder in the room are long gone. A remnant of a bygone era, the file folder has sputtered out like an athlete that stayed one season too long. Dropbox has replaced physical file folders and allows for quick and easy sharing of information. The blog has also replaced the need for paper assignments that would go into the folders as well. With nothing to place in the folders, the folders have opted for retirement. The Filing Cabinet : With its long time companion the file walking off into the sunset, the filing cabinet sits in the corner as an icon to a time in education where a person could hold all the valuable information they needed in one neat and organized location. It was ok that access was only available during set school hours and never over the summer. Times have changed and now the filing cabinet sits as an ancient relic occasionally used to store party supplies for the holidays. Here are some tools that are not retiring, but are very close to announcing their retirement; email, scanners, textbooks, desktop computers, single student desk, and the classroom. What has made the move to retirement in your room?